Phoenix Forklift Training and Certification will get you Ahead! Forklift jobs in Phoenix will remain in demand – but are you ready to provide your employees with OSHA compliant training? With CertifyMe.net, you’ll have all the OSHA training you need to be successful – and safer – on the job. Sign up today with CertifyMe.net, and ensure your forklift drivers have the training they need! Let’s look at some different forklift jobs in Phoenix, along with the advantages of getting OSHA certified ASAP! The need for forklift operators is increasing in Phoenix, as mentioned above, but workers still need to complete a Phoenix forklift certification to qualify for jobs. Forklift training has become a requirement for all operators by OSHA because it is the most effective method for reducing accidents on a work site and the number of injuries and fatalities that happen as a result of them. In addition to protecting workers’ safety, forklift training is also designed to help you be more productive at work, which not only helps you be more successful but also increases an employer’s bottom line and makes you more valuable to them. That’s just one of the many reasons why forklift certification in Phoenix is so important! Here’s another reason: Phoenix forklift certification is required by OSHA. If your company is involved in an accident and your workers don’t have the training credentials, heavy fines and penalties will have to be paid. The benefits of forklift training in Phoenix, AZ, works both ways. Sure, it’s ideal for employees looking to take the next step in their career path. But CertifyMe.net’s OSHA forklift courses and forklift certification in Phoenix are also used by employers to limit liability and, more importantly, have the best-trained forklift drivers all throughout Phoenix and Maricopa County. There are a ton of great employers in the Phoenix area. With the city growing more and more each year, employment opportunities abound – and your company needs to provide forklift certification in Phoenix for all prospective employees!. Learn where to get forklift certification. Not all applicants will have Phoenix forklift certification. If they don’t, you’re responsible for providing training. But with CertifyMe.net, you can let us handle these requirements. We’ll get your workers OSHA compliant effectively and affordable! If you’re having difficulty finding Phoenix forklift certification providers look no further than CertifyMe.net Our forklift certification in Phoenix is ideal for small, medium and large companies in the greater Phoenix metro area. Sign up with CertifyMe.net today, and see how our forklift certification in Phoenix can elevate your safety program in no time at all. Accidents and related mishaps at Phoenix job sites are similar to those in other parts of the country. A recycling plant accident hit the Phoenix Business Journal newswire a few years ago but accidents are not a frequent part of the forklift work environment in Phoenix. With warmer weather almost year-round, the weather changes that cause accidents in other major cities can be avoided by workers in Phoenix. Forklift training in Phoenix can better equip you against all kinds of accidents and falls. Get your forklift certification in Phoenix with CertifyMe.net and improve your company’s safety! If you’re considering forklift certification in Phoenix, you’ll be greeted with a wealth of job opportunities and new career choices once you’re ready to enter the workforce. You have the ability to complete your forklift certification online, without the necessity of sitting in a stuffy, overheated classroom from day to day. 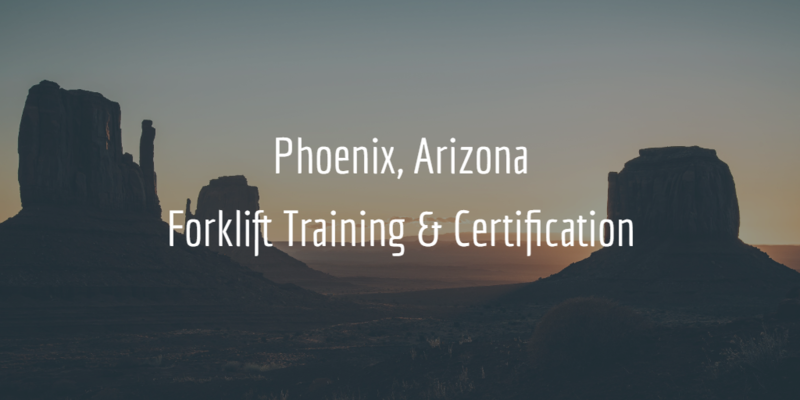 If you’re looking to change your career with forklift certification, Phoenix is the place! You also have the option to complete our train the trainer program if you’re an experienced operator and want to teach new workers how to operate forklifts. And re-certifications are always free! Sign up today! For questions about our training, or if you’d like to speak with our forklift certification experts for Phoenix, give CertifyMe.net a call today at 1-888-699-4800. You can also get started today – click here and you’re on your way to becoming OSHA compliant today.